My nephew had a Spanish girlfriend once, and she made a salad similar to this one for Christmas. 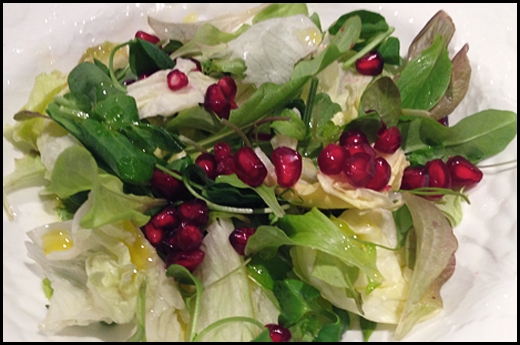 November and December are a perfect time of year for Pomegranate Salad, since the pomegranates are nice and ripe. Lately, I can even find organic ones! This lovely girlfriend made the salad with escarole, but I have a hard time finding organic escarole, so I made it with a mixture of iceberg and homegrown micro greens—the main idea is that you have some fresh lettuce. It’s very simple and easy to make, and the vibrant color makes it perfect to serve for a festive occasion, or even for dinner for one. You can also add some thinly shaved slices of Manchego cheese, which adds a nice Spanish flair. Or you can add some crispy bits of Duck Confit, which tastes good on anything, basically. Mmmm! Sounds lovely. Reminds me of the wonderful salads your eldest daughter makes. Our fav breakfast/snack/side/dessert right now: orange sections and pomegranate seeds. Love those pomegranates!